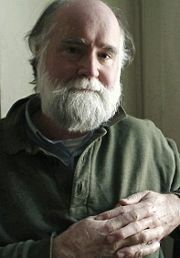 Nicholson Baker is most recently the author of Human Smoke. Condition of Mr. Segundo: Deceased. Subjects Discussed: Baker’s antipathy for placing the date at the top of an entry, the blogginess of A Box of Matches and Human Smoke, the discrepancy between what Baker remembered and what Updike wrote in U & I, anchored time, the “Splunge” sketch from Monty Python, subjective vs. objective, ground rules, contradictory sources, America First, parallels between September 11, 1941 and September 11, 2001, repeating phrases, cutting out Churchill speeches, Howard Schoenfeld, trying to squeeze invents into an impacted timeline, sources, Baker’s father, the Treaty of Versailles, imbuing a history with a cast of characters, Roosevelt, Victor Klemperer, “The Charms of Wikipedia,” how text informs perspective, Human Smoke as a pointillism of fact, text as a mutable medium, the footnotes in The Mezzanine, traps within the text, form and content, the dialogue-only books (Vox and Checkpoint), Thomas de Quincey, digressions, the anarchic narrative of life vs. the enforced narrative of the book, Baker’s aborted musical career, Vox‘s “what happens” narrative, a Theory of Everything for Baker’s oeuvre, the sudden plot within the last 20 pages of The Fermata, the late episodic novels, Henry Ford, Alfred Sloan and the German economic miracle, Edwin Black’s IBM and the Holocaust, the moral ramifications of industrialism, giving cultural weight to pacifists, Columbine, pinning blame on ancillary factors, following the thread, intelligence and the capacity of observing everything, Sherlock Holmes, having huge gaps of knowledge, William Hazlitt’s “On the Conduct of Life,” preservation, found shopping lists, people who are moved to go on record, the advantages of indiscriminateness, New York World, Johnny Carson, revisiting Baker’s complaints about scanning in Double Fold in light of digital developments at Harper’s and The New York Times, newspaper language, the inefficiencies of newspaper online archiving, why The New York Times is better today than in the 1930s, the natural selection of informative details, Human Smoke as a Rorschach test, and the gradients of ideology. Baker: What I always find is that the stuff that was kept indiscriminately is often more interesting than the stuff that was deliberately kept. You know, the stuff that was in the pocket of somebody when — I don’t know, when some terrible thing happened. The shopping list that you find on the sidewalk. I mean, there are many, many shopping lists right now in people’s lives. Millions of them. And I’m not going to worry that they’re all being thrown out. I don’t think that people should be saving all their shopping lists. I just think that it’s sometimes beautiful to have one and think about the order of things on it. And that anytime you have those odd things in a place like Wikipedia, if you have strange, sometimes misshapen entries that people have written about something that they want — an ancestor that they’re proud of or themselves — that there’s something really fascinating about what it was that moved people to want to go on record for that thing.